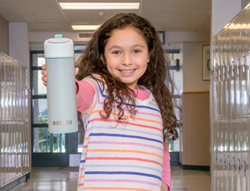 Our astrea project team’s goal with this campaign was to create a product for families that would offer the most effective and portable solution to lead contamination showing up inside homes, schools and throughout the community. A recent investigation by USA Today identified 2,000 water systems spanning all 50 states where testing has shown unsafe levels of lead in drinking water over the past four years. In addition, a growing number of schools across the US are also reporting unsafe levels of lead in water, a major issue considering research studies show exposure to lead and heavy metals particularly impacts children’s brain development and cognitive function. Consumers are invited to pledge their support to “Kick the Lead Out!” on the Indiegogo campaign page that opened today and is expected to remain open for the next 30 days. In addition to supporting clean water here in the US, a portion of all funds raised during the astrea™bottle campaign will be donated to water.org to support the charity’s efforts to provide better access to clean water globally. The astrea team leveraged HaloSource’s proprietary technology and assembled a team of world-class scientists, product designers and engineers to design the new astrea™ bottle and filter. In addition to removing lead and other heavy metals to the NSF 53 standard, the bottle will also ensure your water tastes great. Other innovative features of the stainless steel, insulated bottle include a fill-through lid which makes refilling easy and a locking straw for anti-spill security. HaloSource, Inc. innovates and integrates technologies to deliver clean drinking water solutions to partners with trusted brands around the world. The Company works with scientists and industry experts across the globe in search of new ways to improve drinking water quality and has been awarded more than 30 patents for its ground-breaking chemistries, which provide safe drinking water for millions of consumers globally. The Company's class-leading HaloPure® Drinking Water technology has the highest global certifications, including registration with the US EPA. Founded in Seattle, Washington, HaloSource has grown to become an influential leader in drinking water purification. HaloSource is headquartered in the US with operations in China and India. Learn more about the Company's research and development and future novel technologies by visiting http://www.halosource.com and http://www.astreawater.com. The HaloPure® and astrea™ brands are registered trademarks of HaloSource, Inc. All other trademarks, brand names or product names belong to their respective holders. This document contains certain forward-looking statements relating to the Company. The Company considers any statements that are not historical facts as "forward-looking statements". They relate to events and trends that are subject to risk and uncertainty that may cause actual results and the financial performance of the Company to differ materially from those contained in any forward-looking statement. These statements are made by management in good faith based on information available to them and such statements should be treated with caution due to the inherent uncertainties, including both economic and business risk factors, underlying any such forward-looking information.